Home > Advice > Boozy Debate: Can You Really Drink For Your Health? Boozy Debate: Can You Really Drink For Your Health? It’s a hot summer day, and whether you’re ready for a patio or putting your feet up by the pool, the idea of a frosty glass of your alcohol of choice might be on your mind. If you pass on a cold one for the good of your health, well, here’s some news in favor of that chilled adult drink. Research shows there is one alcoholic beverage that is almost completely guilt-free. But let’s start with a couple of the more sinful offenders. There is a bunch of bad news—and a very small sliver of hope—for the frozen cocktail-lover. Oh those frozen margaritas! Some frozen cocktails (in moderation) aren’t so bad for you. Some of these colorful drinks go heavy on the ice which drops the calories down. So if you must have a strawberry daiquiri, it will run you about 112 calories; the blended ice makes up most of the drink. 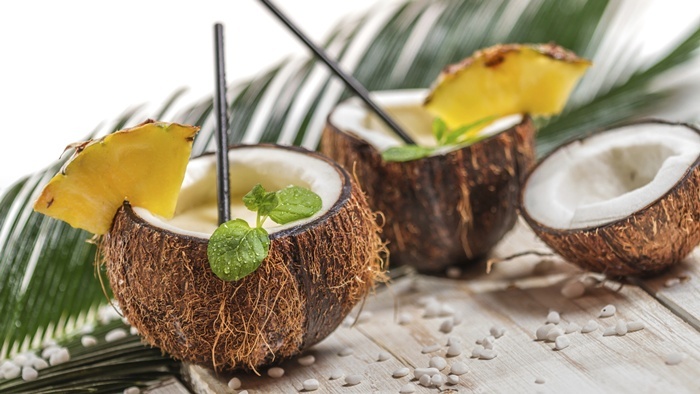 The National Institute on Alcohol Abuse and Alcoholism (NIAAA) says the least skinny frozen cocktail is also one of the most popular: The decadent piña colada will run you 490 calories per 9 fl/oz. So you might need to make a choice…the slim waistline or the cocktail? With calorie counts that high, both might not be in the cards. The health benefits of a glass of red wine have been well documented. Wine is rich in antioxidants and can help with blood pressure and cardiovascular health. The NIAAA estimates that for 5 fl/oz of wine, you also get about 165 calories. That doesn’t sound so bad. But the average wine goblet can hold about three times that amount, so if you get a little generous with yourself and fill that goblet, you are getting 495 calories, taking you back into piña colada territory. Who doesn’t feel a little bit fancy holding a delicate fluted glass of Champagne? The clear benefit to Champagne lies in the conventional flute. An average flute holds only 3 fl/oz, lending itself to some serious portion control. Not only this, but the bubbles that give Champagne its style also fill up your gut, so you feel full faster. Summer for many people means popping a bottle of something or sipping a fruity cocktail. It doesn’t need to be trouble if you know what to choose to maximize your chances of staying svelte well into the fall. Spencer, J., et al., “Champagne is Good for Your Heart,” University of Reading release, 2009; retrieved from http://www.reading.ac.uk/news-and-events/releases/PR259265.aspx.